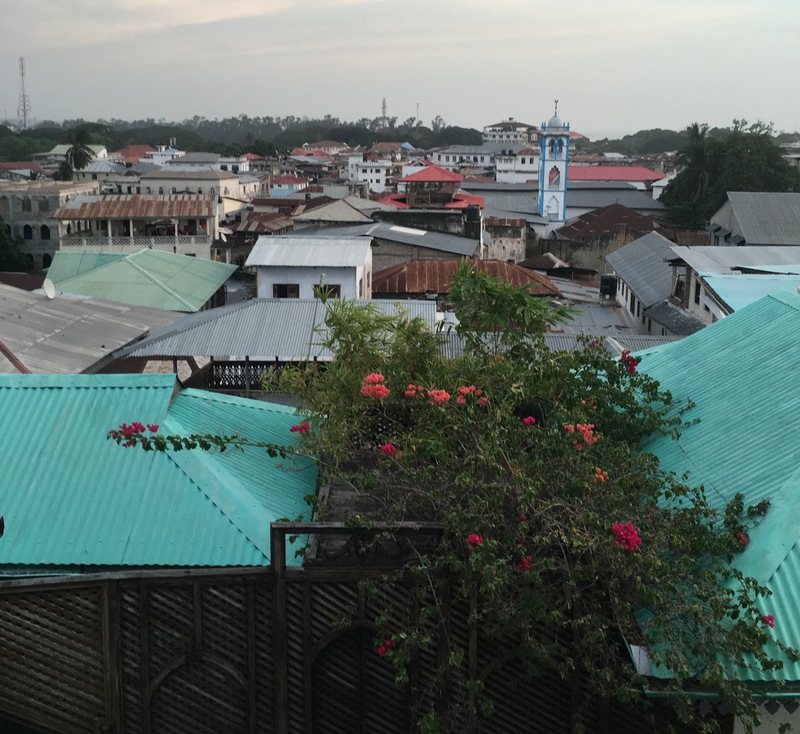 Is there a more exotic-sounding destination than Zanzibar? 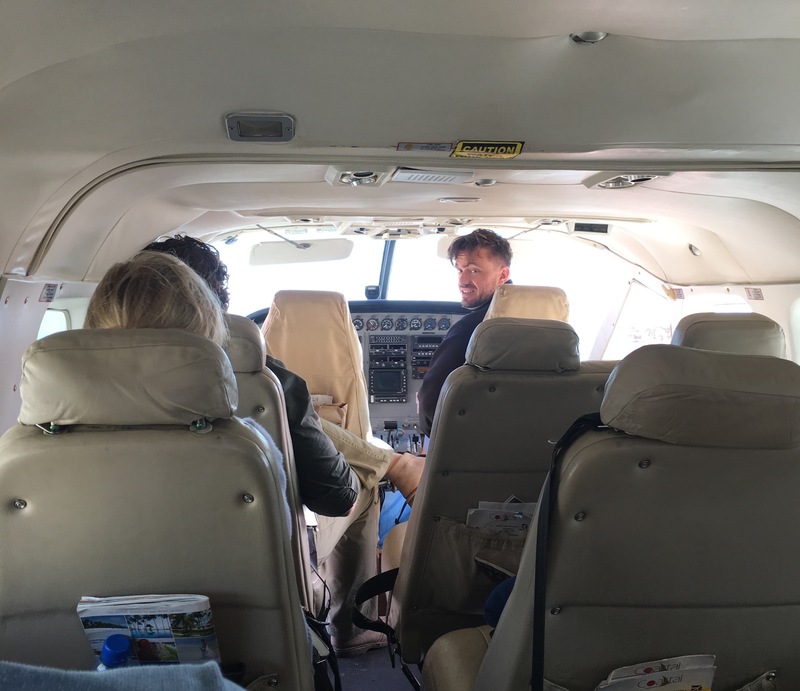 We hop on the tiny Coastal 12 seater plane and skip from the Northern to Central to Southern Serengeti, on to Arusha and over to Zanzibar. After 5 hours of this, the plane is no longer cute and is just a flying tin can and my ears are killing me. Landing in Zanzibar Stone Town it’s clear we’re within a few degrees of the equator. Hot, steamy, humid. We’re dripping within minutes. No this is not a van. It is a 12-seater Coastal Airline plane. Sash sits as co-pilot. Zero training involved. 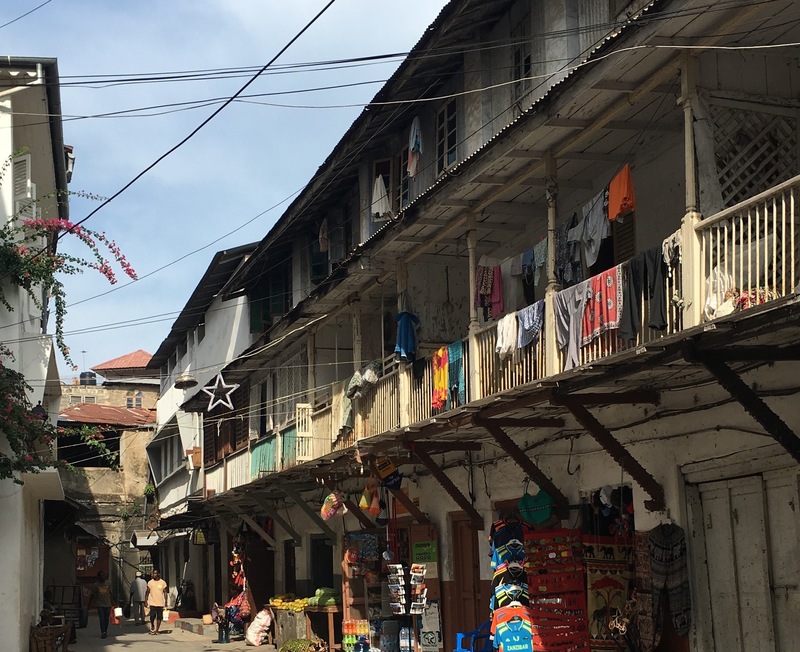 Old Stone Town, once the center of the East African Slave trade (more later), is a twisting maze of narrow streets with famous carved wood doors. 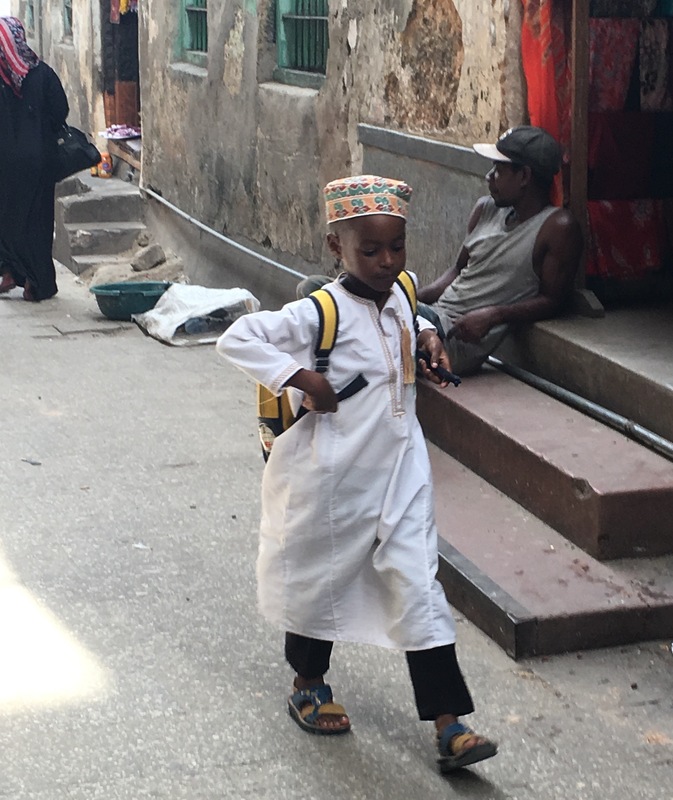 Ruled from Oman for 300 years until 1960 when Zanzibar joined Tanganyika to become modern day Tanzania, the Arab Muslim overlord imprint is everywhere, as is the Indian merchant influence. 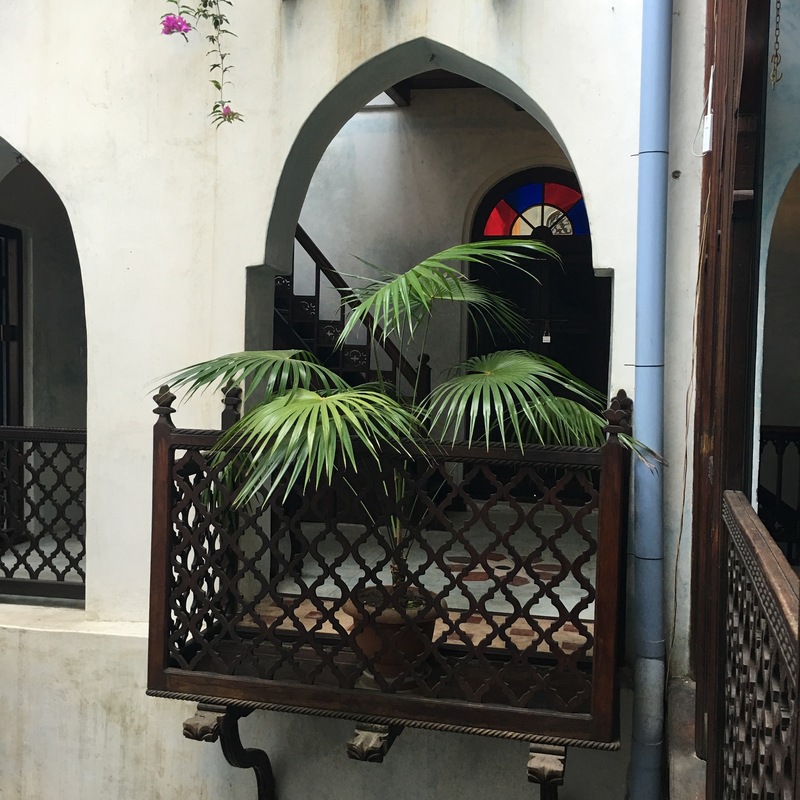 We stay in a restored elegant Merchant home built around a fountained courtyard with carved wooden screens and steep staircase leading up to the rooftop restaurant where the Indian Ocean breeze can kick up quite a fuss. 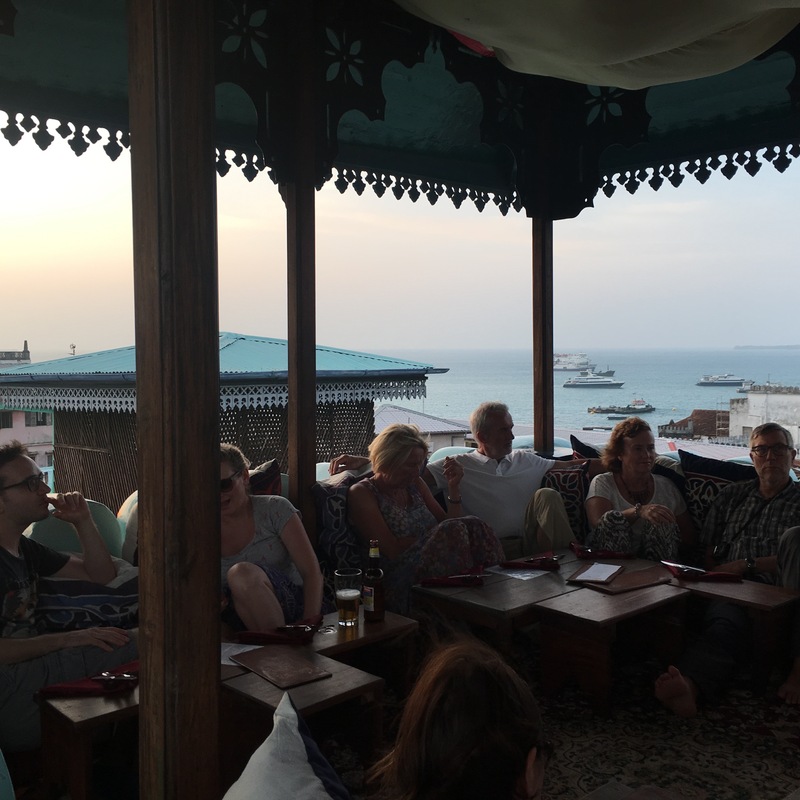 We have sundowner drinks on the rooftop (sundown is the same time every night on the equator) and the sun sets fast – plop! disappears into the sea. 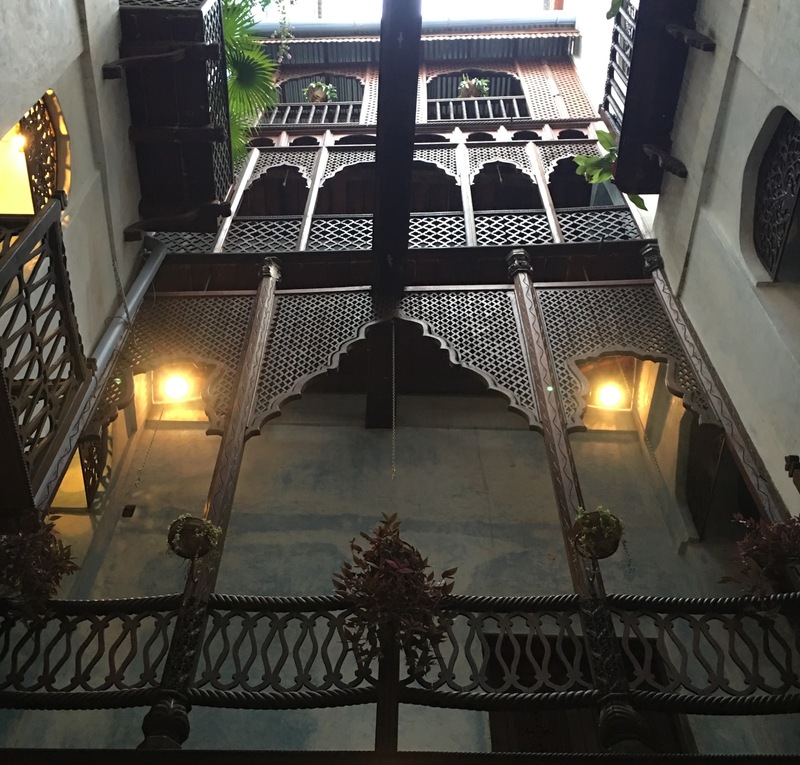 We eat downstairs in the courtyard with a delicious mix of middle eastern and Indian cuisine and the burble of a fountain nearby. Sundowner dinner looking over the harbor. After climbing 6 flights, we are ready for that gin and tonic. Another 6 flights of stairs in the morning for coffee. Excellent coffee, in fact! It’s frankly a shock to see so much humanity after the isolation of the Serengeti. 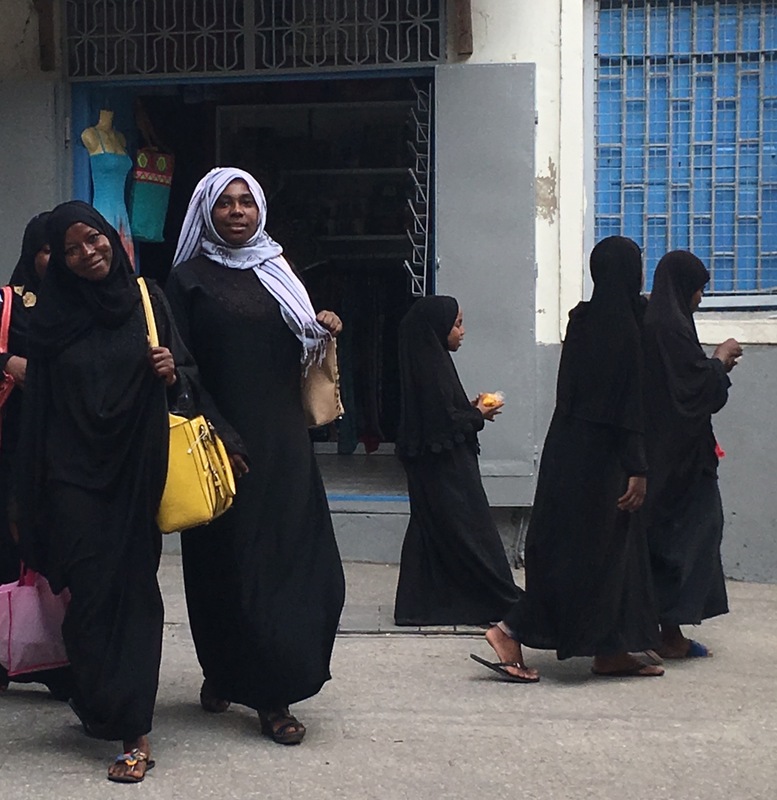 And always jarring to see women covered head to foot – albeit highly colored but still – covered in many layers. They seem quite cool while I am melting. We venture out, realizing that we have no choice but to get lost in the maze. 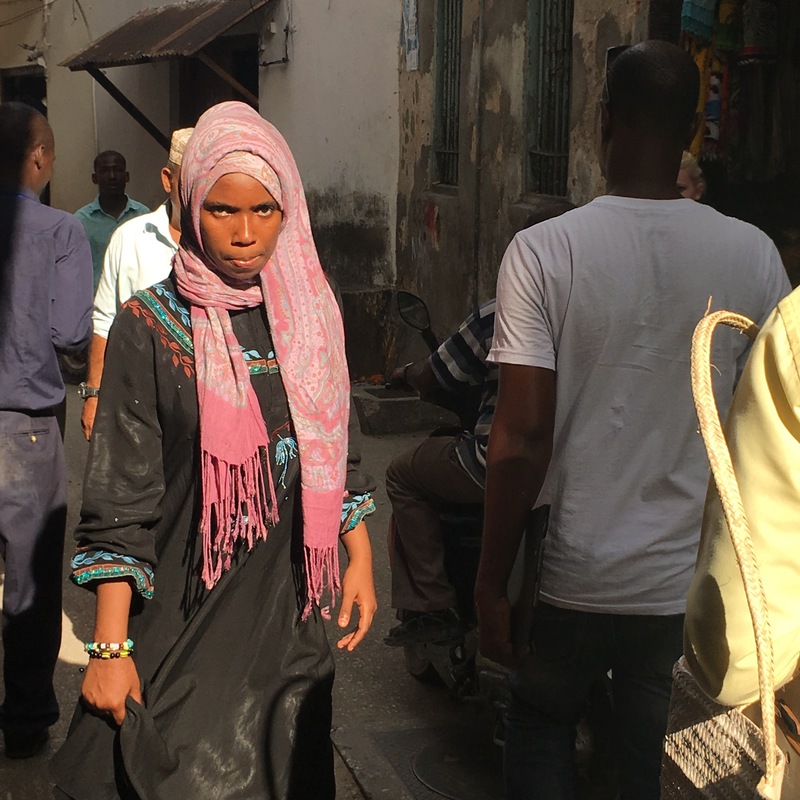 I steel myself against the hard Muslim male gaze – even though I am reasonably covered – and the endless entreaties to visit, look, buy. But truthfully, the entreaties are pretty gentle compared to Turkey or Egypt or Morroco. 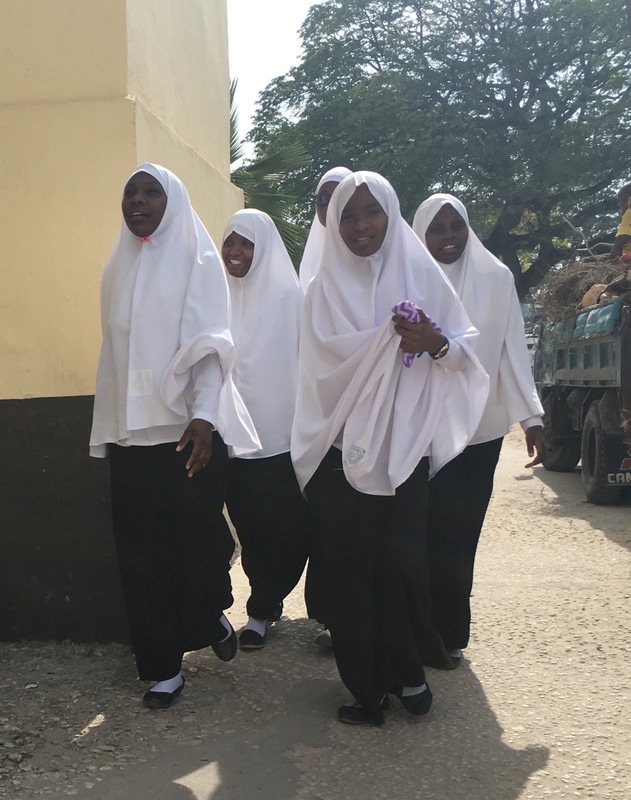 High school girls returning from Madrassa in their school uniforms. A young boy returning from elementary school in his school uniform. 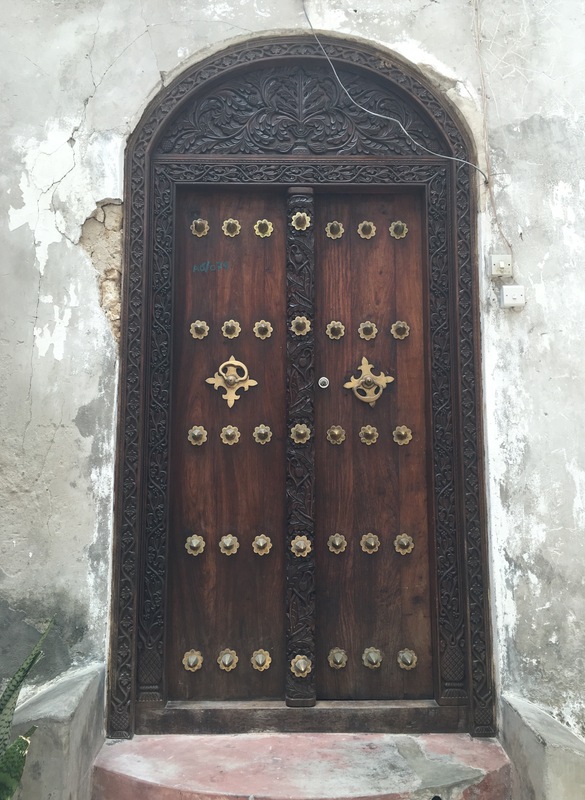 Two of the many beautiful Stone Town doors. One original; one restored. I could take a shower 3 times a day it’s so muggy, and sometimes I do – there is a hammam on our balcony with blowing curtains attempting privacy. Suddenly I understand how David saw Bathseba taking a bath on her roof. 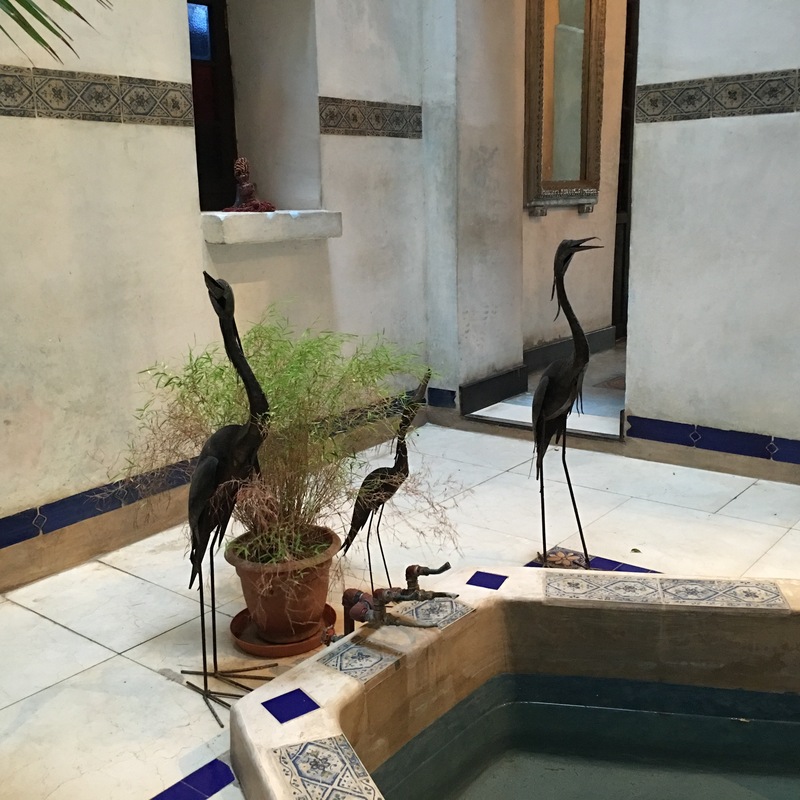 It’s jarring to wash up with the sounds of life just outside – I can peer down into the open balconies where people live out loud and out of doors, and I figure they can probably peer up at me. 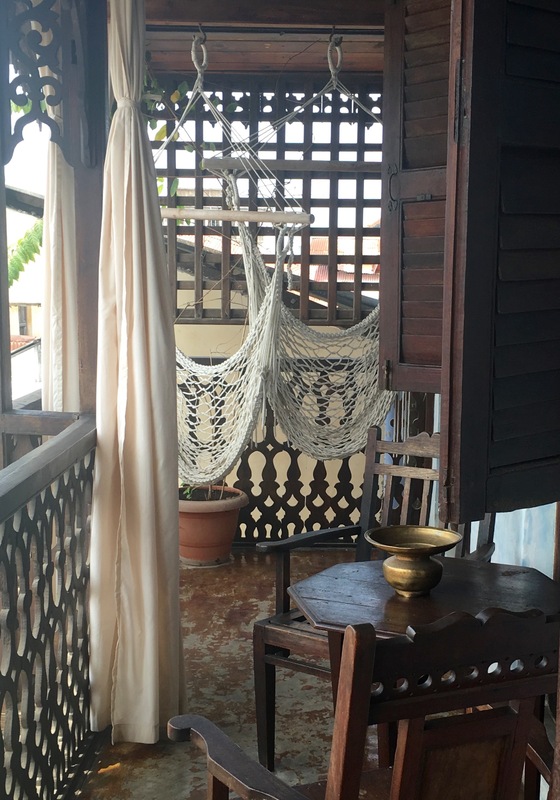 Balcony with hammocks and wood screens and hammam (bath) tucked away. 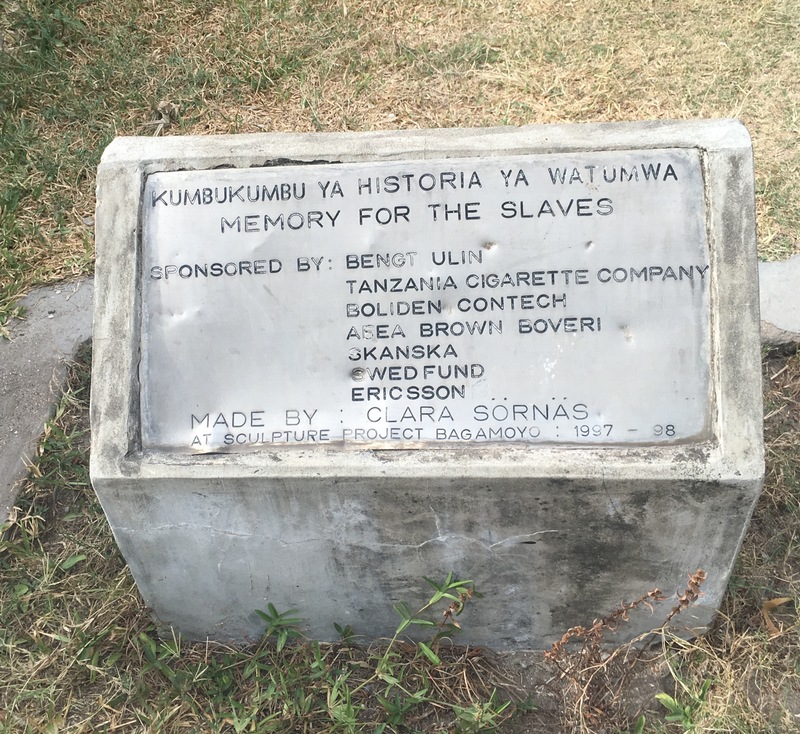 The East African slave trade – centered around the island of Zanzibar and largely controlled by Arab traders from the 8th to the 20th centuries – saw as many as 12 million Africans dispersed throughout East Africa, North Africa, the Arabian Peninsula, the Persian Gulf and the West Coast of India. 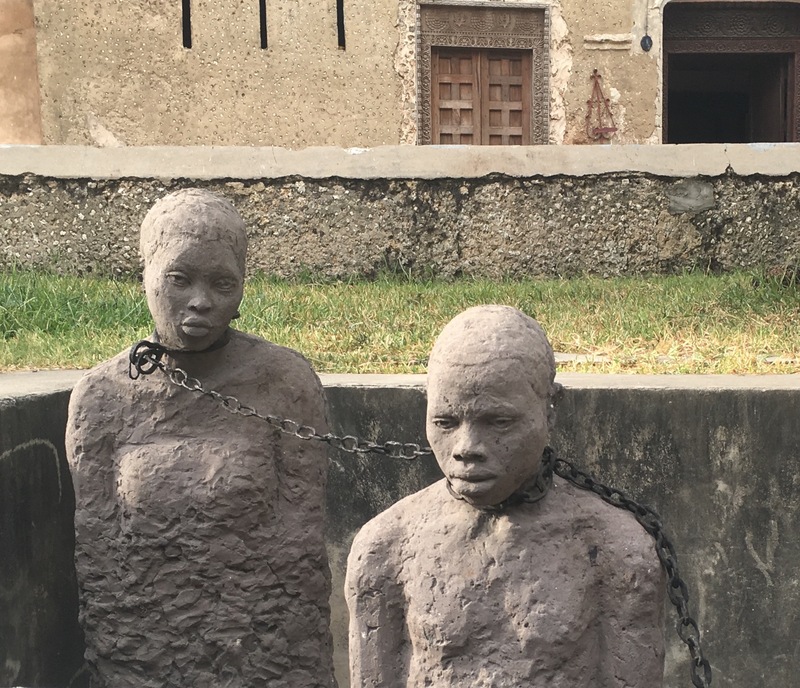 Who knew there was rivalry to the horrors of the West Africa/Atlantic/Caribbean slave trade with which we are much more familiar. Hence the trail of Islamic conversion throughout East Africa – because only infidels can be enslaved. 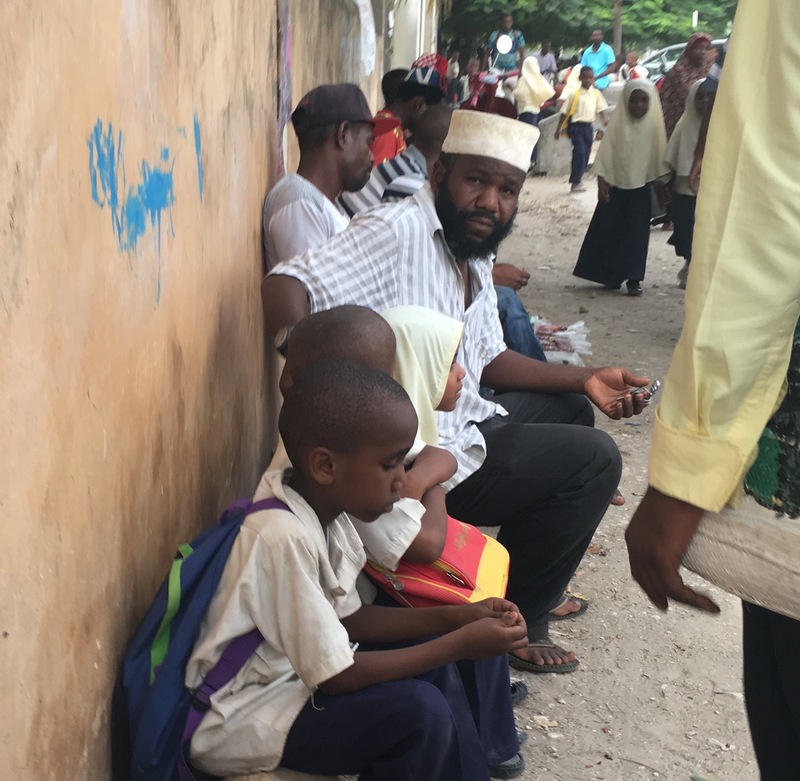 Conversion to Islam could free the next generation but not the current one. The extent of the trade, the trade routes, the size and prosperity of the Arab caravans, the brutality of the raids, tribal destruction and widespread local complicity over hundreds of years – head shaking, headspinning – hard to take in. 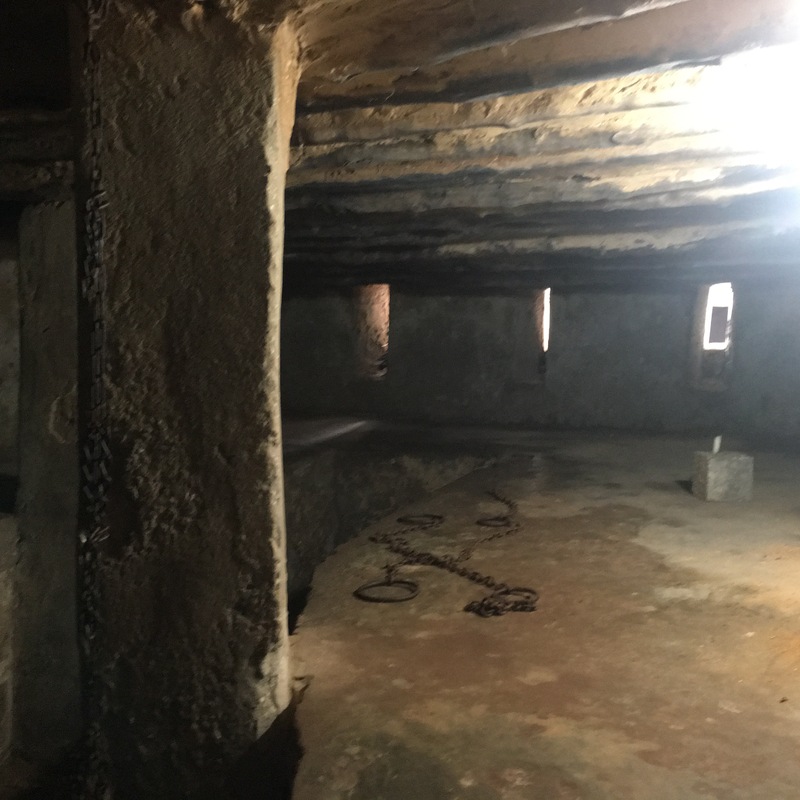 A cramped holding chamber for 70 enslaved women and children once headed for the auction block. 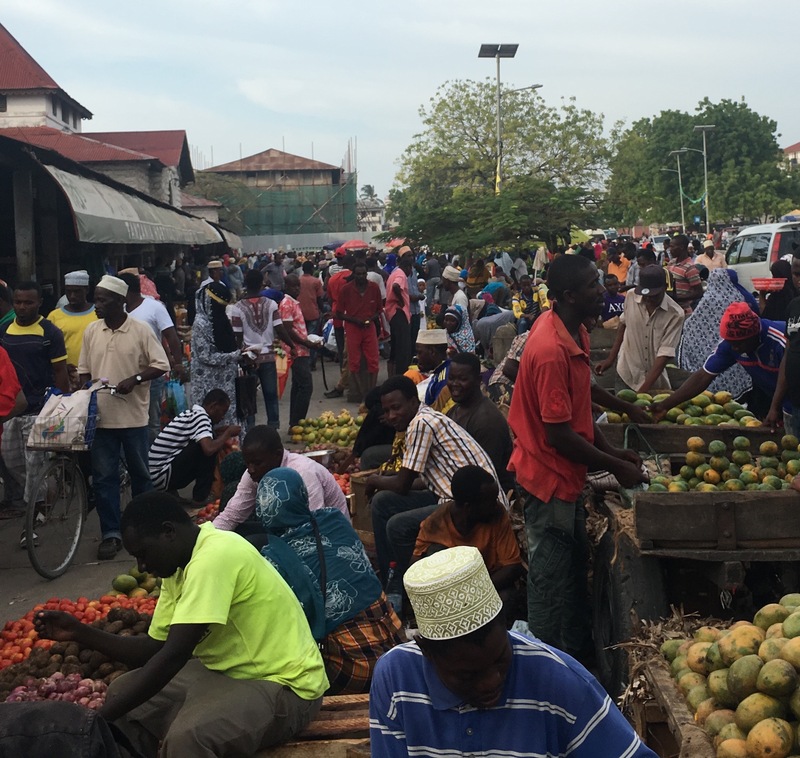 Wednesday Market. Mango, mango. Scent of spice – cloves, cardamon- in the air. An intense discussion about chickens. For the pot or roosters for the ring? 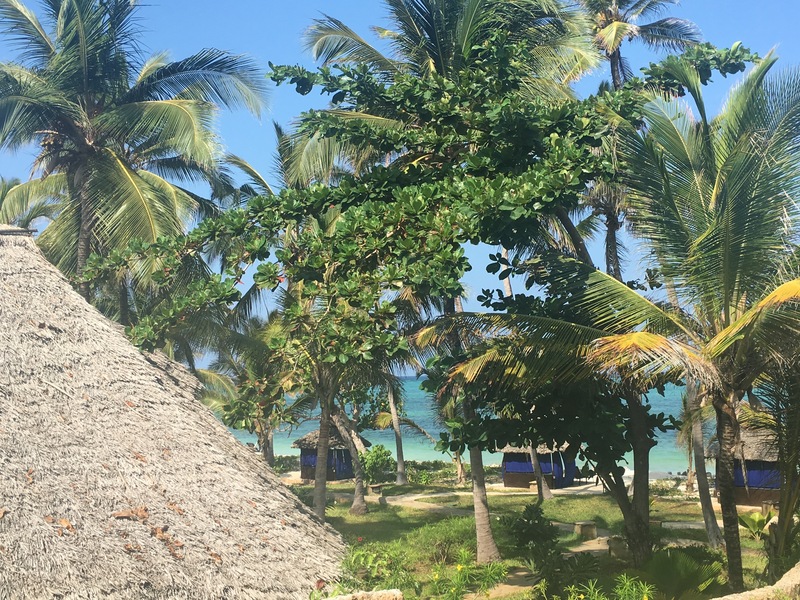 And then we are off to the beautiful Indian Ocean beaches of the Michamvi Peninsula, where the beach is vast at low tide and the water is pure aqua blue. It’s also practically jacuzzi temperature – which does not work for this cold weather gal. But no one else is complaining! 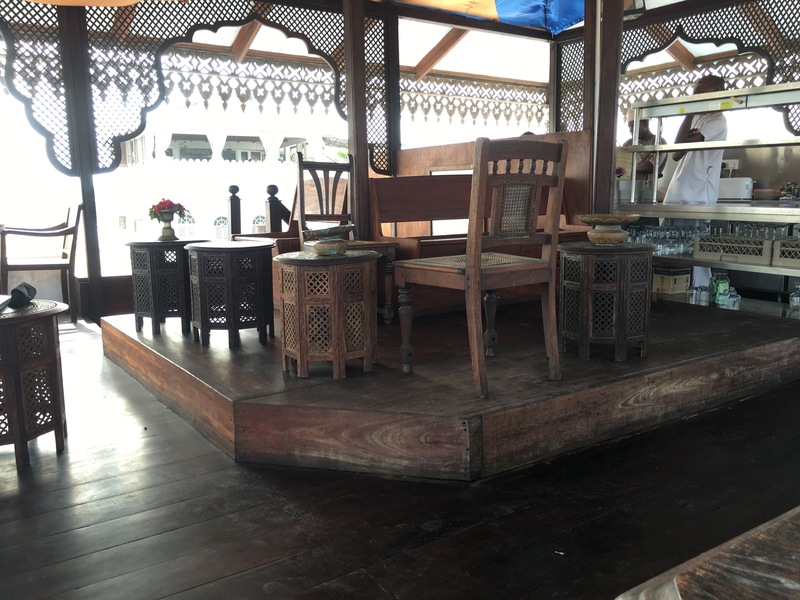 We just have to overlook the sight of small children playing in piles of garbage a mile or two outside the gates of the resort and hope that somehow a small trickle of the money we are spending will make it into their lives. The beach at low tide. A 2 KM walk out to the reef. 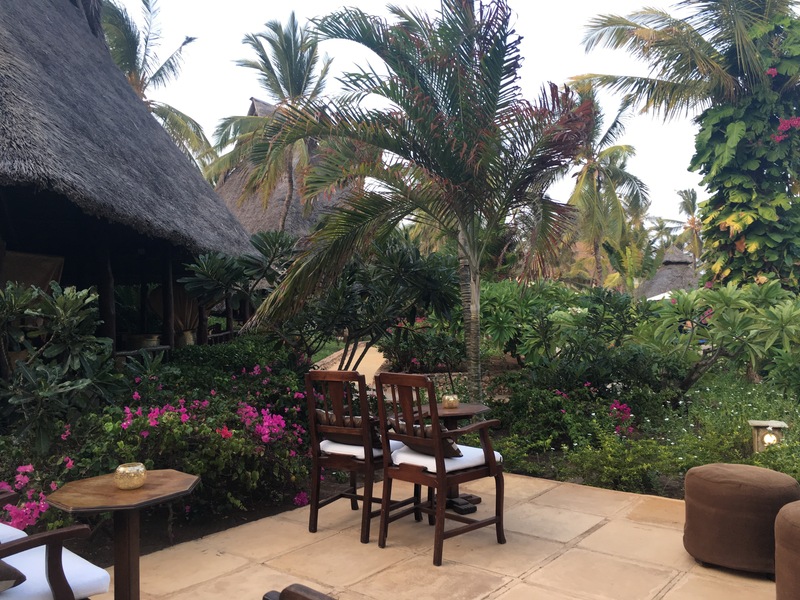 Sundowner cocktails. We are so there. 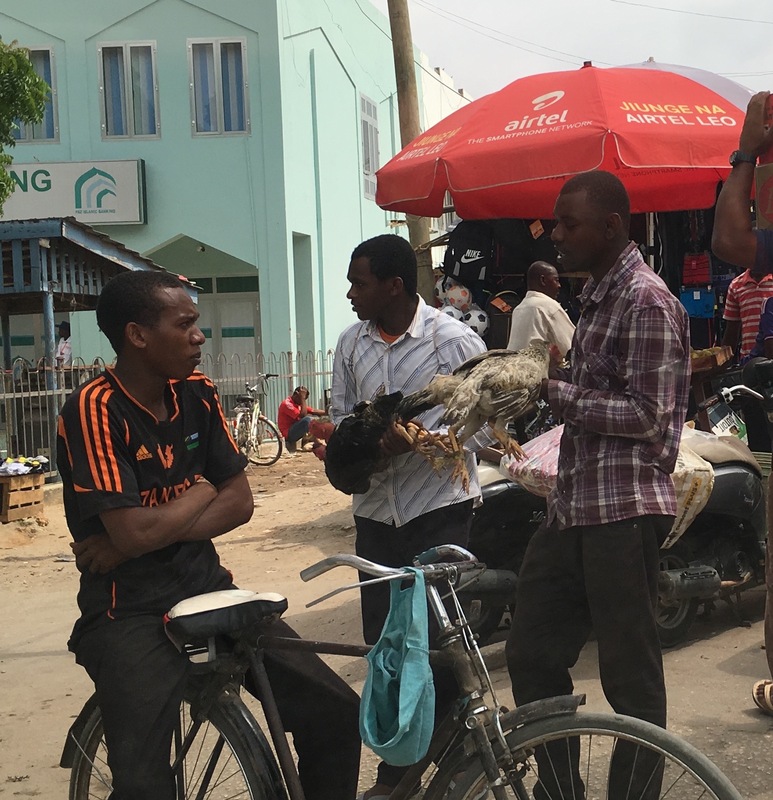 Attention Tanzanian entrepreneurs: Import this fabulous gingery-ginger ale. 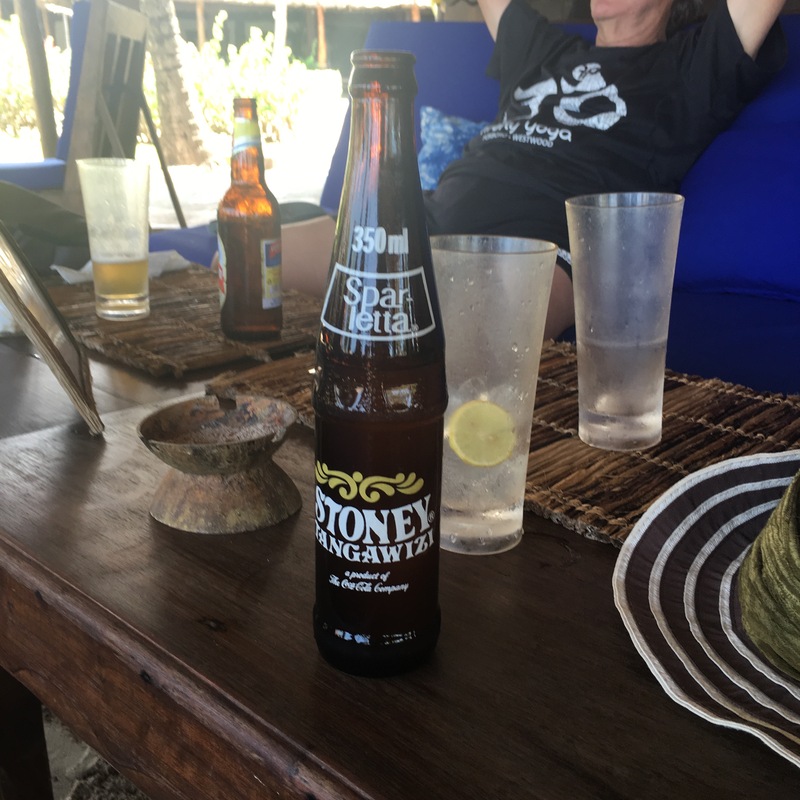 Stoney Tangawizi. Yum!